This book answers some challenging questions in monetary growth theory within a compact theoretical framework. The author succeeds in integrating the theory of money, the theory of value and the theory of growth. The book re-examines many important ideas in modern monetary economics within a single analytical framework. It is concerned not only with traditional one-sector growth models of a homogeneous population with endogenous capital and knowledge, but also with multi-sector models, economies with heterogeneous households, and economies with urban structures, interregional interactions and international trade. 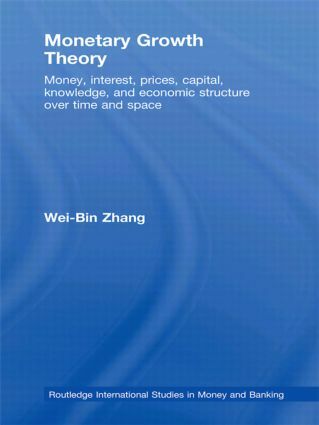 Zhang’s book will appeal to those studying monetary economics, neoclassical growth theory, development economics and international economics. It is also useful more generally, for researchers in social sciences with an interest in the role of money in modern societies. Wei-Bin Zhang is Professor at Ritsumeikan Asia Pacific University, Japan.